In the year 2000, I encouraged the tens of thousands of people who read my first book, Nonprofit Web sites, not to chase technology with their limited resources. Rather focus most of their efforts on providing relevant and compelling content in order to engage people. Why did I say that, you may be wondering? Because, I've seen charities spend decades on constant technology "improvements" only to eventually realize they can't keep up with for-profit companies in their development of technology. Unfortunately, this learning comes at a high price for the charity. In fact, years ago I was in a meeting with a top executive from a large nonprofit who bragged about all of the fantastic data points their new database will one day be able to capture. "We're just eighteen months away from having a killer marketing program," he said. My response was, "why are you spending so much time and money on a relational database if you are only going to send "Dear Friend Letters" to your donors? Widget Technology is a great example of how new applications are being developed all of the time. One interesting thing about widgets, it appears the love affair for them is waning in the for-profit arena while they are becoming a tremendous fundraising tool for nonprofit’s constituents online. It is one thing to have a dream of turning your donors/constituents into fundraisers but it is another to actually provide them with the tools and know how to make it happen. Here are a Baker's Dozen of ideas to help you and your donors/constituents to create great fundraising widgets in order to help raise money from their family and friends. 1. Have an income goal and indicate it on your widget. 2. Create a sense of urgency with a deadline to the fundraising campaign. 3. Be the first to donate that way everyone you send it to sees at least one donation going forward. 4. Send the widget first to family members. In most cases, your family is your inner-circle of support and are the most likely to contribute, which will help you gain momentum. 5. Next, send the widget to your closes friends, then it to second tier friends, people at work and such and so on. 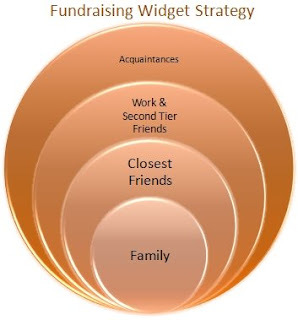 This way by the time you send your fundraising widget to you acquaintances it will be overwhelming at the participation level that they will feel compelled to join. 6. Make sure you upload a personal photo of yourself, it will help people realize quickly that this widget is from a friend. 7. Also, uploading an image that presents the cause you are raising money for will help to inspire people to give. 8. Some widgets let you include a link to a landing page with more information and/or a video. 9. There must be a clear call to action. 10. Post your widget everywhere you can, such as your personal Web site, Blog and Email Signature. 11. If you have a page on a social network, such as Facebook, Squidoo, MySpace, etc. you feature a link to your widget URL. 12. Don’t forget all those people in your address book that you can send a link to your fundraising widget. 13. Search for blogs about your cause and inspire the people behind those blogs to write about your efforts. Perhaps their readership are the like-minded individuals you seek. Here are a few Web sites to help you get started creating your own charity's fundraising widget campaigns.